This novel is part of the Warhammer series of novels. I don't read enough of them to know what order this might fit into or if there is any order to them at all, but the novel seems to stand alone. 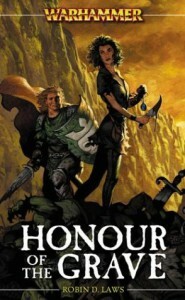 This is actually the second Warhammer novel I've reviewed. Unfortunately, what started as a fun fantasy romp couldn't stand Angelika's shifting personality.